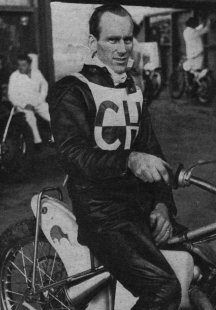 Goog started riding speedway in New Zealand in the 1950's but swapped between other motor sports at that time, both on two wheels and four. He made his debut in the UK in 1964 at the age of 32, with Newcastle, he played a part in the Diamonds League Champions success that season scoring 83 points in League Matches for an average of just under 5 points per match. His was an ever present in 1964 scoring 100 points from all competitions. With the joining of National and Provisional Leagues in 1965 forming the new British League Goog had to move on with the Diamonds retaining Ivan Mauger and Brian Brett. He moved on loan to Cradley. He kept his average of around five points with some steady performances. His best score being in his very last outing for the Heathens on 30th October 1965 with a score of 11 from 5 rides. He missed out in League competitions in 1966, choosing to do some 'Open' meetings instead. In 1967 he returned to Brough Park Newcastle and had his best season in the UK upping his average to just under 6, and scoring double figures on eight occasions. Goog represented Great Britain on two occasions on ice in the USSR in the World Ice Racing Championships, almost qualifying in 1968 when he crashed and spent some time in a Russian hospital. But it was a crash at West Ham in 1968 which finally finished his career with a serious knee injury. He did try a comback in January 1970 for New Zealand against England but with two pointless rides decided to hang up the leathers.